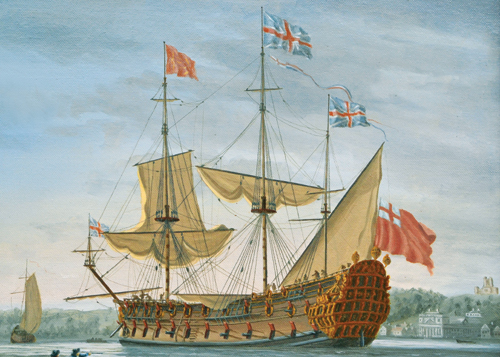 The Master Shipwright's House opens its doors this weekend for London Open House. Joint hosts The Lenox Project have invited a team of re-enactors to bring a flavour of the period when the building was part of Deptford's Royal Naval Dockyard. The original Lenox was launched in 1678; the Grade II listed house was built later in 1708 on the site of an earlier building. A large wall separates the house and gardens from the old dockyard site now known as Convoys Wharf, where the only other surviving above-ground building from the time of the dockyard is the Olympia Shed (viewable from the site entrance on Princes Street – or from the river!). You'll be able to visit selected rooms inside the house, enjoy views of the river, watch the re-enactors demonstrate how life was lived at the time (including the loading and firing of period firearms and cannon), catch up with the Lenox Project's progress and meet the historian who's documented the extensive research on which the project is based. On Saturday you may also chance to see the Thames Sailing Barge Parade making its way from Tower Bridge to West India Dock or catch a glimpse of a tall ship (part of Sail Greenwich 2016). No booking required, entry is free but, as with all the more popular Open House listings, there may be queues. Also in the vicinity on Saturday, The Lenox Project's sister project Sayes Court Garden CIC will be running a (briskly paced) walking tour at 2pm, in association with the Landscape Institute. 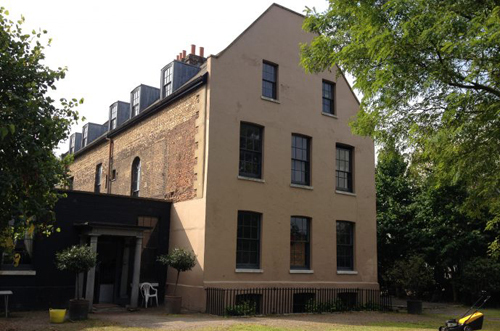 The tour starts at Sayes Court Garden in Grove Street SE8 3LN, the only surviving part of John Evelyn's original garden which inspired the creation of the National Trust, as well as modern ideas about sustainability and horticulture. Booking required. For other places to visit in Lewisham go to the Open House London website. A FREE family friendly afternoon and evening packed with activities for kids, live music from local artists, art workshops, local films and food. Come and explore the garden! 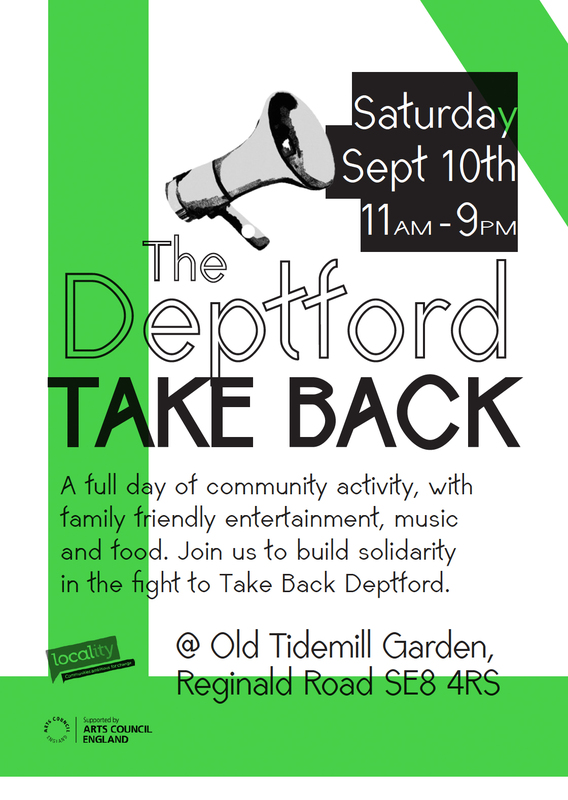 The emphasis is on fun, but festivities will also contain a serious side and begin at midday with The Deptford Debates – discussing all the changes taking place in Deptford and how local people can have a voice. Deptford Neighbourhood Action (DNA), a group of locals who are developing a Neighbourhood Plan to benefit the community rather than the usual vested interests, will also be holding their AGM at some point between 12 and 3pm and welcome new members. * The plans for the new Tidemill development propose to deliver only 6% affordable housing (with 176 out of 210 homes being luxury private housing) by demolishing a council block (2-30A Reginald Road for which there is little support from its 16 tenants) and the schoolkeeper's house next to the old school, as well as destroying the existing Tidemill Garden by removing 73 trees and building over it, and removing all green space in Reginald Road until construction is complete. The proposal is due to be decided by Lewisham's Strategic Planning Committee on 29 September. Use the search facility on this blog for previous posts on Tidemill and/or check out this post about the developer's Viability Assessment by the Deptford Dame. 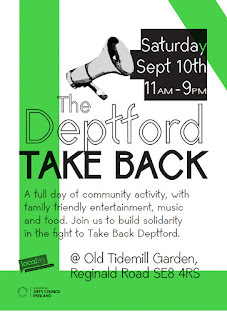 A joint event organised by Deptford Neighbourhood Action, The Deptford People's Project, The Deptford Debates, Evelyn Community Revival in Deptford SE8 and Trade Deptford.